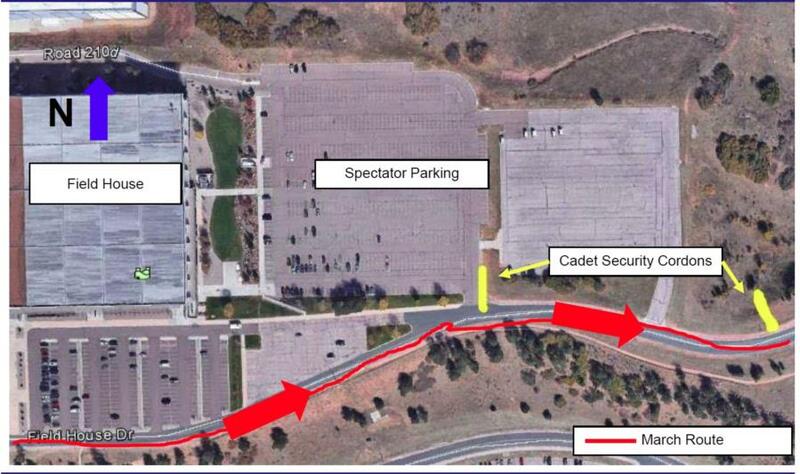 Sunday is the March Out - Below is the map for parents who are close by and able to come cheer on the Class of 2022 as they march out to Jacks Valley for the second part of Basic Training. North gate should open at 0600 for visitors and the March Out will begin approximately 0700. Please park where it shows Spectator Parking on the map, do not park along any roads! You can bring signs but you CANNOT interact directly with your cadet. Yelling encouragement is fine of course. Route: Terrazzo, down Core Values Ramp to Cadet Drive, right on Field House Drive, left on Parade Loop, straight onto Jack’s Valley Road. The Parade Route is depicted in red. Also - expect rolling street closures throughout March-Out (0700-0900). That's all for the moment. We'll be back later with Doolie Day Out coverage!